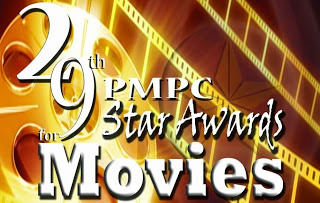 Biopic film 'El Presidente' wins big for the 'Movie of the Year' award for the 29th Star Awards for Movies ceremony held on March 10, 2013 at AFP Theater in Camp Aguinaldo, Quezon City. The film which is based on the life of Gen. Emilio Aguinaldo was shown last December 2012 and an official entry to the Metro Manila Film Festival . Once again, the biographical film bagged major awards for this year Star Awards for Movies. Jorge 'ER' Ejercito- Estregan was named 'Movie Actor of the Year' and Mark Meily grabbed the 'Movie Director of the Year' award. Angel Locsin, the top contender for 2012 MMFF finally hailed as 'Movie Actress of the Year' for outstanding performance on 'One More Try', Star Cinema movie. Last MMFF, Nora Aunor was named 'Best Actress' for 'Thy Womb' inspite of expectations of fans and moviegoers for Angel.